In the wackiest of a lively series (Last Chants, 1996), plucky San Francisco lawyer Willa Jansson defends a man who says he was in a spaceship when his car fell on top of a Buick, killing the driver, Francis Addenauer. Alan Miller tells this story after having been put under hypnosis by psychiatrist Fred Hershey. At Fred's request, Willa returns to Santa Cruz to represent Alan, who's as embarrassed as she by his outrageous recovered memory. Skeptical but indefatigable, Willa finds four quarrelsome UFO experts to testify for Alan. Meanwhile, Alan and his support team are being harassed by Addenauer's grieving widow, Betty. Matera is skilled at creating singularly offbeat characters and hurling them into multilayered plots that play out on the fringes of popular culture. Here, exploring the many facets of Ufology, from crop circles to government cover-ups, she shows how tales of alien contact (""our fastest-growing oral tradition"") foster sinister interpretations of ordinary events. It's the weirdest defense Willa's ever mounted, and in the end, readers, like Willa, will wonder where Alan really was that night. 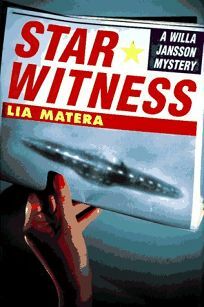 (June) FYI: Includes a UFO bibliography and videographys.